Shares in Bahamas Petroleum (LON: BPC) slipped 6 per cent despite confirmation from the government of The Bahamas that the company's licences were in full compliance with all legal formalities. Sept. 10, 2012 (Darshini Shah) – Shares in Bahamas Petroleum (BPC) slipped 6% despite confirmation from the government of The Bahamas that the company’s licences were in full compliance with all legal formalities. The company has recently completed a Front End Engineering Design (FEED) study, which provides a detailed well plan. The company confirmed that the drilling commitment for 2013 will be dependent upon on the outcome of a national referendum, which the government intends to hold, on oil exploration in Bahamian waters. 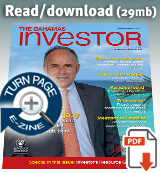 This is an excerpt from Interactive Investor as it appeared on September 10, 2012. For updates or to read the current version of this post in its entirety, please click here. Bahamas Petroleum, the oil and gas exploration company with offshore licence permits in the Bahamas, has been given written confirmation by the regional government that it is in full compliance with the terms of its signed oil exploration licences, the provisions of the Petroleum Act and the Petroleum Regulations of The Bahamas. A 20-member strong private sector group is travelling to Haiti this week to foster trade ties with the nation. Watch a ZNS report here.